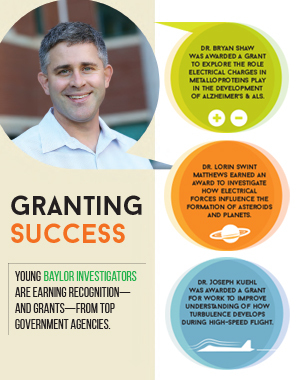 Young Baylor investigators are earning recognition— and grants—from top government agencies. There’s no way around the fact that research is a very costly enterprise. It requires expensive equipment and special facilities, and it takes decades for researchers to gain the education and experience necessary to make strides in their chosen fields. Federal agencies like the National Science Foundation and the National Institutes of Health once provided more than half the dollars spent on research and development in America. Today, that percentage has fallen to little more than a third. Although federal funding is getting tighter, the NSF, NIH and other federal funding agencies continue to invest in the careers of bright young investigators who have demonstrated exemplary ability and whose areas of research offer the potential to solve particularly vexing scientific and technical problems. In recent years, two Baylor researchers have earned five-year, NSF Faculty Early Career Development awards— commonly called “CAREER grants”—for work in vastly differing fields. Dr. Lorin Swint Matthews, an assistant professor of physics in the College of Arts & Sciences and associate director of Baylor’s Center for Astrophysics, Space Physics and Engineering Research (CASPER), received her $405,000 CAREER award to investigate the electrical and other forces that cause particles in the dusty ring that surrounds young stars to clump together, ultimately forming asteroids and planets. Despite its distinctly cosmic focus, Matthews’ research has the potential to expand our understanding of particle-laden plasmas here on Earth, where they are used in many industrial and medical processes. The research topic that won Dr. Bryan Shaw his NSF CAREER grant also involves electrical charges, but on a vastly different scale. Shaw, an assistant professor of biochemistry in the College of Arts & Sciences, believes that a very small change in the overall charge of metalloproteins—proteins that contain metals—may keep them from combining into the harmful plaques found in the brains of Alzheimer’s and ALS sufferers. Part of his award also will go to expand a project he developed that uses a 3D printer to create enlarged models of proteins to help blind and other sight-disabled students “visualize” these complex structures. The National Institutes of Health and some of its constituent organizations have similar programs. Dr. Shawn Latendresse, assistant professor in Baylor’s department of psychology and neuroscience, received a Career Development award from the NIH’s National Institute on Alcohol Abuse and Alcoholism in support of his research into how people succumb to alcoholism. His five-year, $811,648 grant will fund the use of a method known as Integrative Data Analysis to uncover new relationships from data gathered during previously conducted long-term studies. And it’s not only scientists who have their work recognized with these special grants; engineers also have their work singled out for support. Dr. Joseph Kuehl, an assistant professor of mechanical engineering in Baylor’s School of Engineering & Computer Science, recently was awarded a three-year Young Investigator Program grant from the Air Force Office of Scientific Research. Kuehl’s proposal for hypersonics research was chosen from over 200 submitted in competition for the $359,000 grant. His work will improve understanding of how turbulence develops during extreme high-speed flight, perhaps paving the way for a new generation of aircraft that can circle the globe in only a few hours.